This article first appeared in the April 2010 edition of Cycle Sport magazine and is the first in a series of Classic Races in which we talk to the key protagonists in some of the greatest races of all time. 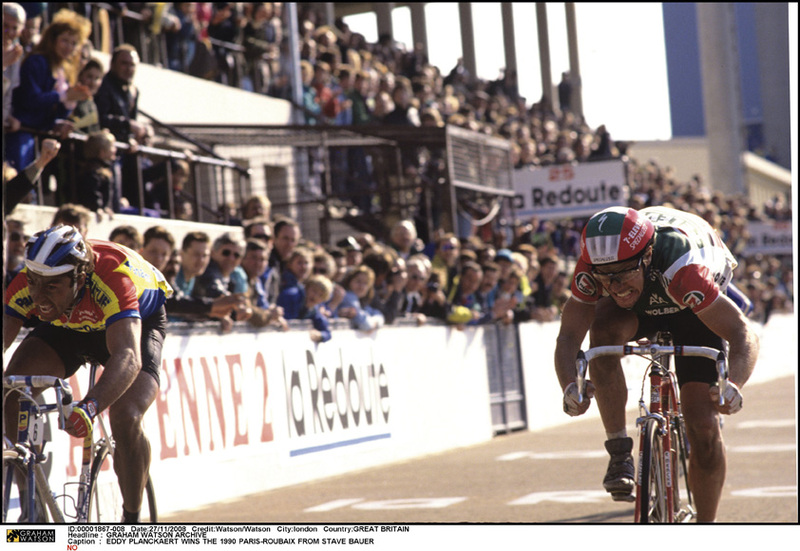 As soon as Eddy Planckaert and Steve Bauer crossed the line in the Roubaix velodrome they glanced across at each other. Neither of them was prepared to claim victory and, as it turned out, both riders had hit the line with their eyes tightly shut anyway. And if they didn’t know who’d won, it was unlkely anyone in the velodrome would be able to split them. Instead of a cheer, there was a suspense-filled ‘ooh’ as the two riders hit the line side by side, followed by a rising murmur of debate. Even the voice of the commentator that had been pumping out of the loudspeakers around the velodrome all afternoon went quiet. He didn’t know who’d won either. For more than ten agonising minutes the blazered members of the race jury scrutinised the photo finish pictures in a little hut at the back of one of the stands. The technology was up-to-date for 1990, though nothing spectacular by current standards, but it was all they had to go on. A slightly grainy, freeze-framed, black and white picture of the split-second the front wheels of Planckaert’s Panasonic-branded bike and Bauer’s Eddy Merckx hit the line. It took plenty of deliberation and even with the photograph and the straight edge of a ruler it was difficult to tell, but eventually they agreed and the head judge, a man named Joel Menard, announced their decision. The Belgians in the crowd, and there were plenty of them, cheered. Planckaert collapsed into the arms of his sports director and older brother, Walter, and Bauer slumped onto the grass in the centre of the track, consoled by the helpers from his team. Damn, that was close. 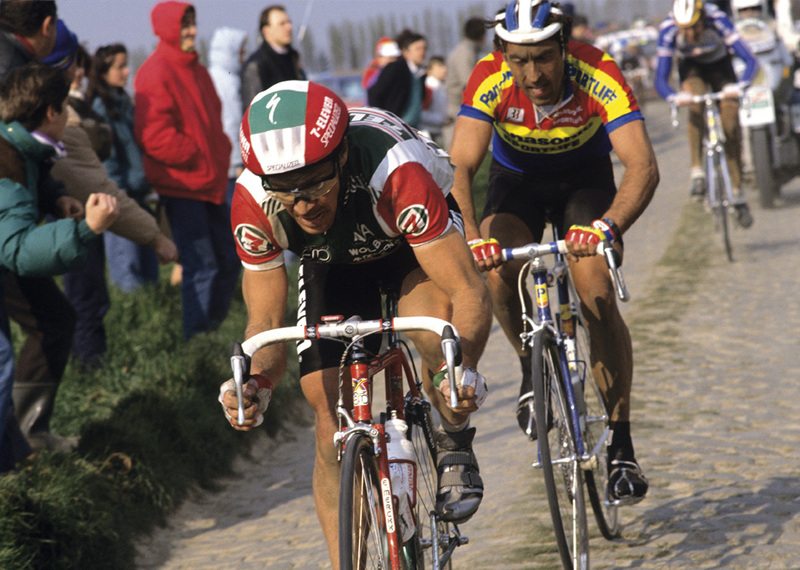 Eddy Planckaert had won Paris-Roubaix, the most demanding single-day bicycle race in the world, by less than a centimetre. 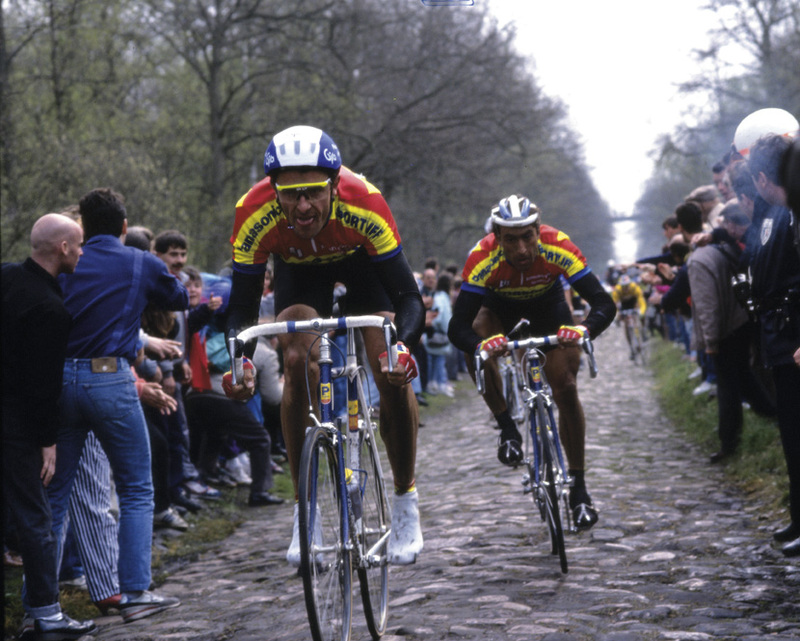 Planckaert always felt he was destined to win Paris-Roubaix and become the first of the three cycling brothers to bring home one of those cobblestones as a trophy. Willy, 14 years older than Eddy, had been fourth in 1966 and Walter, ten years Eddy’s senior, equalled that in 1973. But time was beginning to run out for Eddy to put the Planckaert name on the roll of honour of a race known as the Queen of the Classics. He was 31 and probably had a good few years left, but a couple of fifth places was the closest he’d managed to get. Every time, something went wrong. A puncture, a crash, a moment’s inattention. For 1990 he had returned to Peter Post’s Panasonic team after two years with the ADR squad. Panasonic had a team packed with powerhouses and, with the fall of the Berlin Wall allowing riders from Eastern Europe to turn professional, Post had been quick to snap up East Germany’s Olympic champion Olaf Ludwig and Russia’s Vjatcheslav Ekimov. 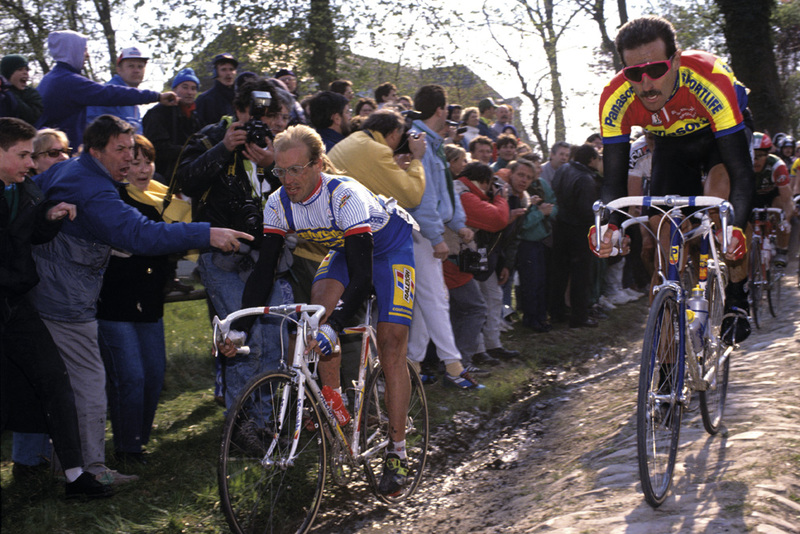 Panasonic also had the defending Paris-Roubaix champion, Jean-Marie Wampers, another Belgian, in their line-up. Post, as usual obsessed with victory, told his riders that they had so much talent in their team that it would be tantamount to a crime if they were not to win. Planckaert woke up that morning and felt strong. In fact, he’d felt good all week. 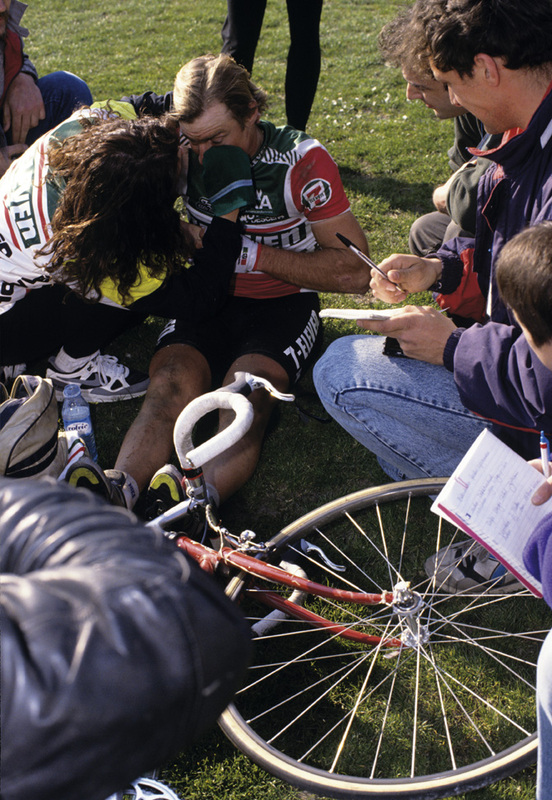 The previous Sunday, a puncture just before the Oude Kwaremont ruined his chances of a second Tour of Flanders victory. And although he didn’t want to go too deep during Wednesday’s Ghent-Wevelgem he was finding it surprisingly easy to follow the wheels and he barely felt the cobbles. Another puncture eliminated him from the final showdown. As he ate his breakfast on the morning of Paris-Roubaix he joked that he was owed some luck. Like Planckaert, the Canadian Steve Bauer was built for Paris-Roubaix. He was stocky and strong and he ate up the cobbles. Although he wasn’t brought up among the fields of Flanders and the region’s broken roads, he felt comfortable there. Ever since turning professional, Paris-Roubaix appealed to him and he had made his home in Belgium so the roads were familiar. In 1988 Bauer finished eighth, a result that gave him the confidence to believe he could one day win it. Later that year he finished fourth in the Tour de France, but the week of the three big cobbled Classics still motivated him and was the big target of the first part of his season. “The cobbles always suited me,” he says. “I’ve got a small frame, not too tall, muscular, I guess a low centre of gravity, and I rode a small frame too. For Paris-Roubaix I had a bike with a long wheelbase with the saddle pushed back a little so I could use the hamstrings a bit more, keep the big gear going. It was like a Cadillac on the cobbles. I had a pretty smooth pedal stroke so that helped too. He was in no mood to be cautious, he knew he had to get his strike in first. Being in such a strong squad, there was the added complication that one of his team-mates might deny him the opportunity. Stephan Joho, a Swiss rider with the Ariostea team, had attacked early on and was joined by Peter Pieters and Rob Kleinsman of TVM. A strong headwind was blowing and, with most of the race heading in the same north-easterly direction, it was going to be in their faces all day. As ever some big names fell by the wayside, and before things really hotted up, two former winners were more or less eliminated, as Eric Vanderaerden punctured and Dirk De Mol crashed. After the Forest of Arenberg, a group of 20 or so got clear of the bunch. Ominously for the rest, there were five Panasonic riders in it. Planckaert, Wampers, Urs Freuler, Ludwig and John Talen. Post’s team was holding a fist full of kings and aces. Planckaert caught and eventually passed Joho’s group, but the lead was never huge, a minute or so at most, and on straight sections the Panasonic-packed chase group could see the motorbikes following him up ahead. Laurent Fignon took up the chase, applying the pressure on the cobbles, and every time a different rider in Panasonic colours sat on his wheel. “He attacked twice on the cobbles and he could drive for one or two kilometres at 60 kilometres an hour,” says Wampers. “He was so good. I was lucky because I was strong enough to follow him.” Fignon didn’t even bother to ask Wampers to contribute because he knew the Panasonic rider was protecting Planckaert. Fignon was one of the last of the great Grand Tour riders to also be able to ride well in a cobbled Classic, but he was outnumbered, even if he was one of the strongest individuals in the lead group. At the front, the Frenchman Martial Gayant, and an unknown Belgian, Kurt Van Keirsbuick of the Isoglass team, had got across to Planckaert by the time they reached Bersee, with 60 kilometres to go. Until that morning Van Kerisbuick was Isoglass’s reserve and had to quickly get changed and into the right mindset when his team-mate Martin Hendrickx woke up feeling unwell. 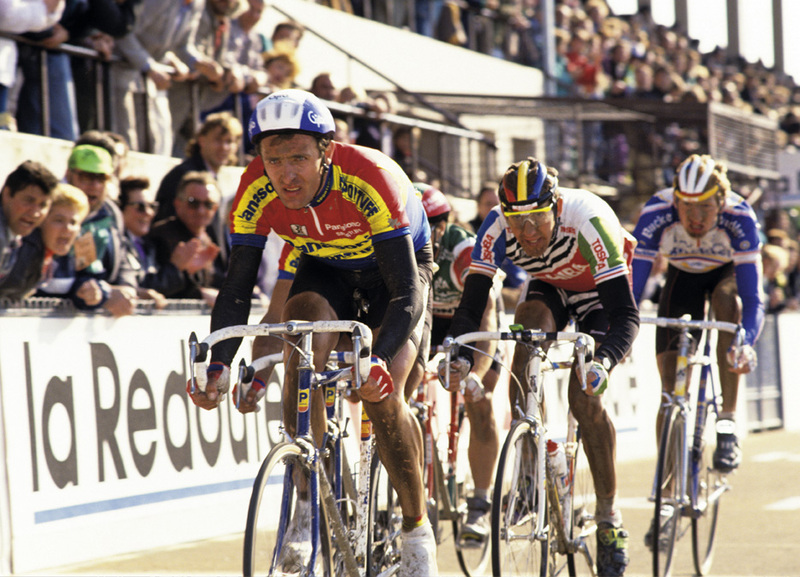 Fignon’s unchained aggression helped Bauer and Panasonic’s other rivals in the group behind Planckaert. “I was patient that day, but when the opportunity came, I went for it. Fignon was doing tons of work, he was over-working really, which was great for us because he brought the gap down to something that was manageable,” says Bauer. First the lanky frame of Edwig Van Hooydonck and then Bauer went across the gap, leaving Fignon behind. They were surprised none of the Panasonic riders went with them. “I countered an attack from Fignon and went ‘boom’ straight across to the break in really quick time,” says Bauer. Frightened that there was a big group closing in on the leading six, Bauer wanted to try to get rid of a some more riders, so he launched a severe attack at Camphin-en-Pévèle with around 20 kilometres to go. Then, as now, it is one of the worst sections and Bauer’s move was so strong that even Planckaert, who had looked sublimely smooth, could not react immediately. The Belgian did not panic. “Bauer was very classy, he was a good boy, but it was important for me not to do anything silly.” Planckaert took his time to ride over without extending himself into the red. Van Hooydonck, feeling tired by now, made more of a meal of it. Behind them, Gayant was chasing alone, with Wampers leading the next group. Bauer and Planckaert took turns on the front and Van Hooydonck sat on the back. Bauer led them round the right-hand bend through the gates and onto the concrete track and was shocked that Gayant and Wampers were almost upon them. The three riders had gone to the top of the banking, allowing the other two to hug the racing line and draw level with them. Jean-Marie Wampers leads into the Roubaix velodrome. Planckaert is obscured behind him. Bauer lurks, Van Hooydonck is ready to open up the sprint from last position. With his track craft, Bauer was hoping to equalise the difference in pure speed between he and Planckaert, but it was Van Hooydonck who went for the long one, a death or glory bid down the back straight, turning over his weary legs and bobbing his head and shoulders, almost lifting the front wheel off the track with the sheer depth of effort he went to. As Van Hooydonck rounded the final bend, roughly in the middle of the track, Bauer dived down to take the preferred inside line, leaving Planckaert with no option but to go the long way, over the top of his lanky compatriot. None of the riders immediately behind had a clue who had won. “I remember a Belgian national junior championship road race [in 1986] once where Wilfried Nelissen and Serge Baguet were so close the organisers made them ride the last one kilometre again, man against man,” says Van Hooydonck. “Of course there was a photo, but I wondered if they would make Eddy and Bauer do another lap of the track if they couldn’t tell.” Nelissen won that re-run final kilometre showdown for the junior title, but fortunately there was no need for that here. Bauer, though, took defeat with philosophical grace. “I did pretty much everything right that day, so I wasn’t going to beat myself up. I was keeping my fingers crossed it was me but I’d done what I could do.” He didn’t see the picture that day but it didn’t cross his mind to question the verdict. “I trusted the photo finish camera and the jury,” he says. “I didn’t check it out in the velodrome, maybe it would have been good to check it out. I saw it a few days later. But whenever he sees the finish of that race a little shudder goes down his spine. “I think it would haunt me the rest of my life if I had lost by one centimetre. I have seen it many times on TV, hundreds and hundreds of times, probably, and every time I watch it as if it was the first time. I swear, I am frightened that this time I’ll lose. Popular Canadian all-rounder – fourth in the 1988 Tour de France after wearing the yellow jersey. Now manages the Canadian Spidertech cycling team, and runs a bike tours company. Tall, prodigious cobbled classics rider, who won the Tour of Flanders twice. Now working as a salesman for a windows and doors company. 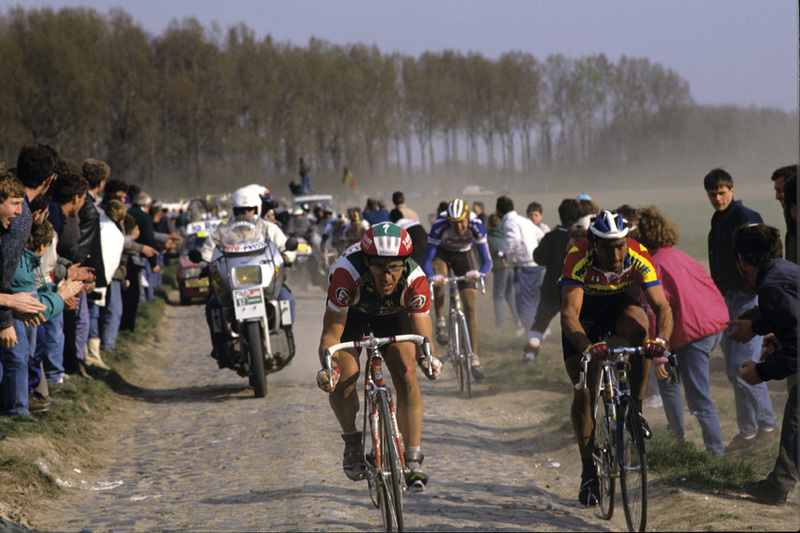 Surprise winner of Paris-Roubaix in 1989, the Belgian was instrumental in defending Planckaert’s lead in 1990. Now working as a salesman.